It has become increasingly difficult to find vendors, at least of the "brick-and-mortar" variety, who sell the once-ubiquitous stereo system. Today, one will find home-theatre systems, "boom boxes," and digital, portable music systems (i.e., iPods, MP3 players, etc.) in stores such as Target and others. But receivers? Compact disk decks? Amplifiers? Hard to find! Yes, you can find dozens of websites that sell all these items but it is rather difficult to audition stereo components online! My premise here has to do with the last, admittedly rather facetious, sentence: the best way to purchase a stereo component or system is to HEAR it. In another Hub article I authored entitled "Whither HiFi," I wrote this: "Now I know today’s music (if such it can be called) consists of three or four minute long pop tunes with a minuscule dynamic range (i.e., the difference between the softest and loudest parts) is perfect for these new gizmos. (Ever notice the advertising for these digital players? 'Holds up to 1000 songs.' 'Songs?' How about symphonies, concerti, operas, or even arias? Sigh.)" 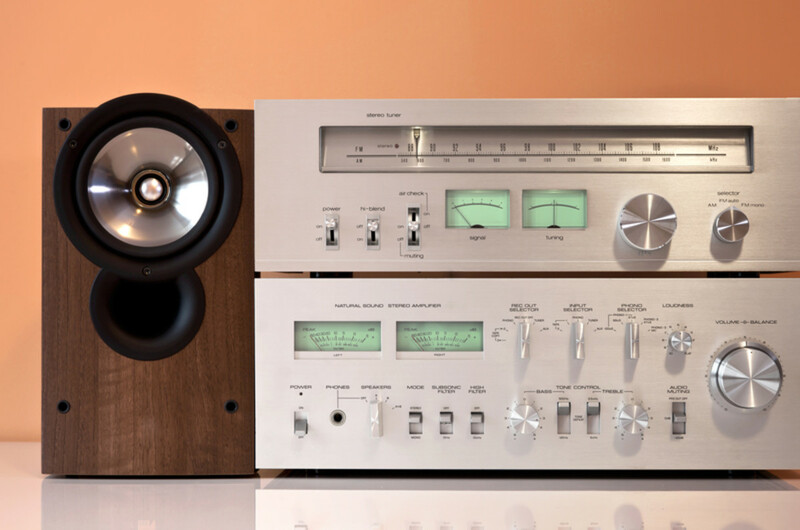 In another Hub article I wrote entitled "High Fidelity, Today's Music, and Today's Listening Habits," I stated: "This brings me back to the quality of sound on the 'systems' commonly used today to listen to music. With four step-children, I am around young people quite a lot and I see (and hear) how they listen to music. For the most part, it's digitally compressed pop music playing over the speaker(s) in a 'smart phone,' or on an MP3 player with earphones, or on a laptop computer, while they do something else. One of my stepsons recently told me he really never sits down and just 'listens' to music. I, on the other hand, will sit in front of my system (sometimes with a cigar and a brandy - great way to do it!) and just listen to the music. On occasion, I'll turn off the lights and sit there in the dark, totally immersed in a symphony, or whatever I'm listening to." 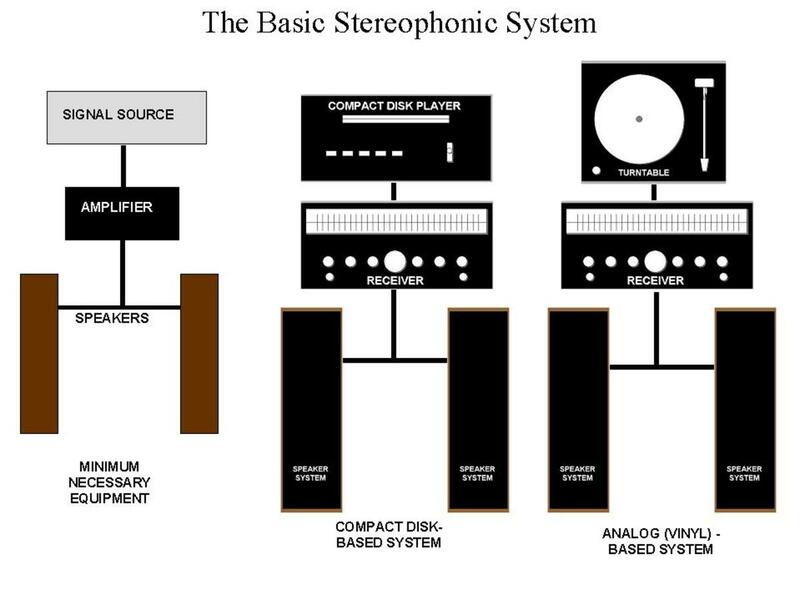 The items depicted in the graphics are, classically, what most stereo systems consist of. 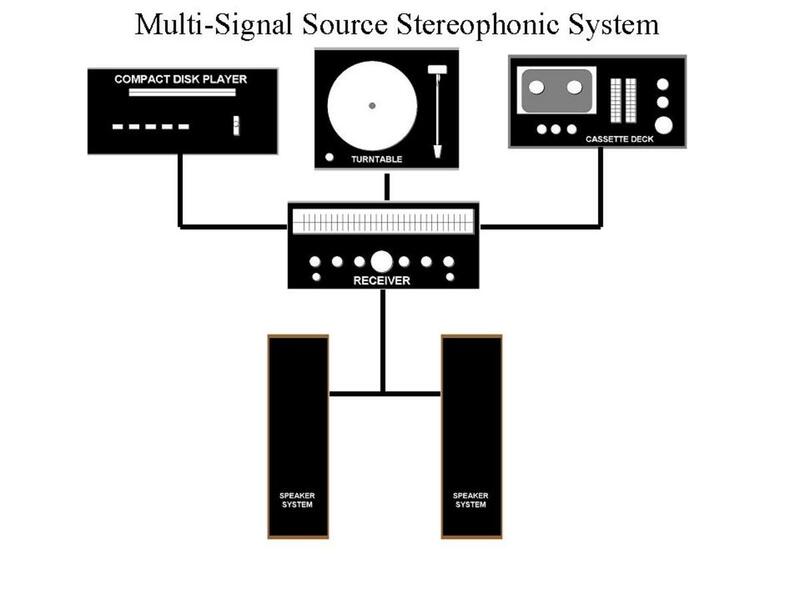 The majority of two-channel (stereophonic) systems consist of one or more signal sources (CD player, tuner, turntable, tape deck, etc. 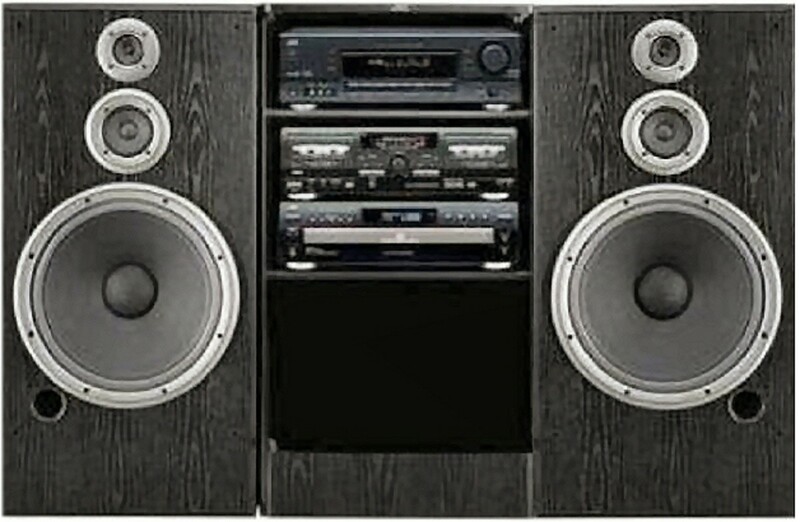 ), a receiver, and two speaker systems. (Note I said "speaker systems," rather than simply "speakers." 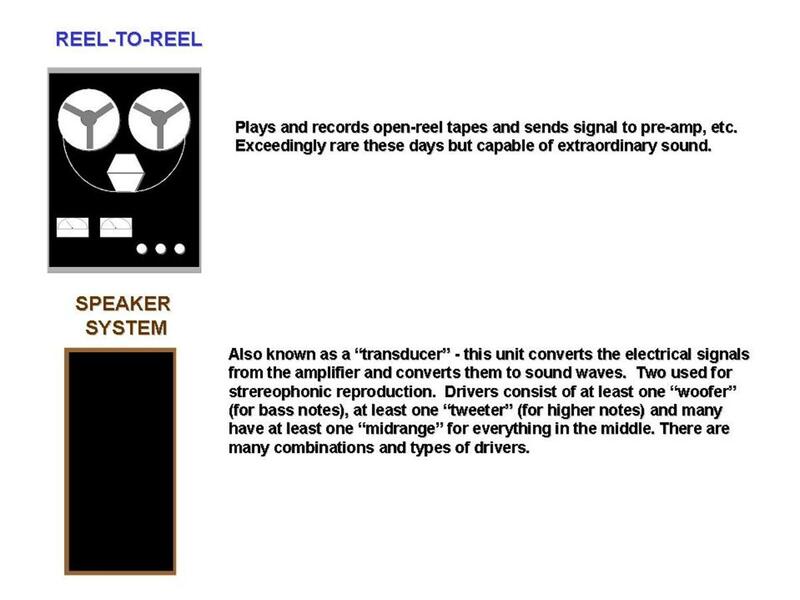 With few exceptions, competently designed speakers consist of two or more drivers and a crossover system, the latter item sending the audio signals [bass, mid-range, treble] to the appropriate drivers. Thus, a "speaker system.") 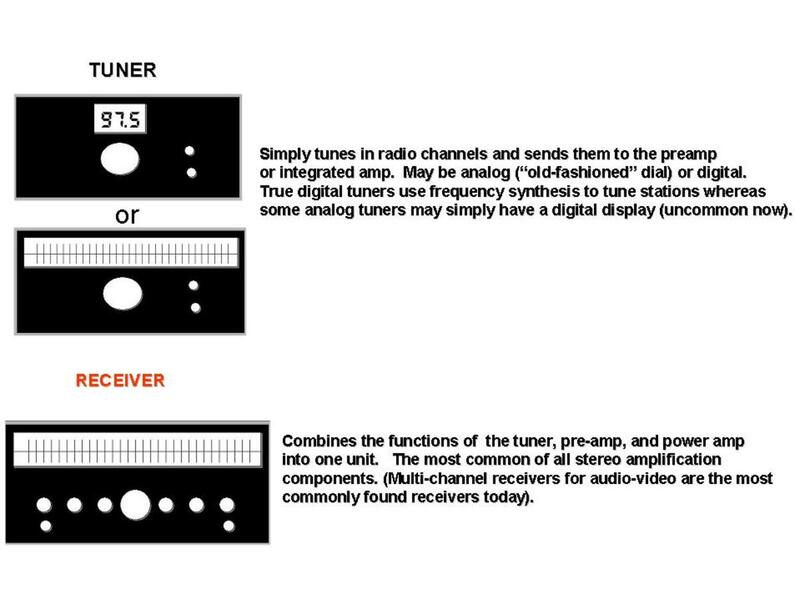 As you can see, the receiver combines the functions of radio tuner, preamplifier, and power amplifier on one chassis. 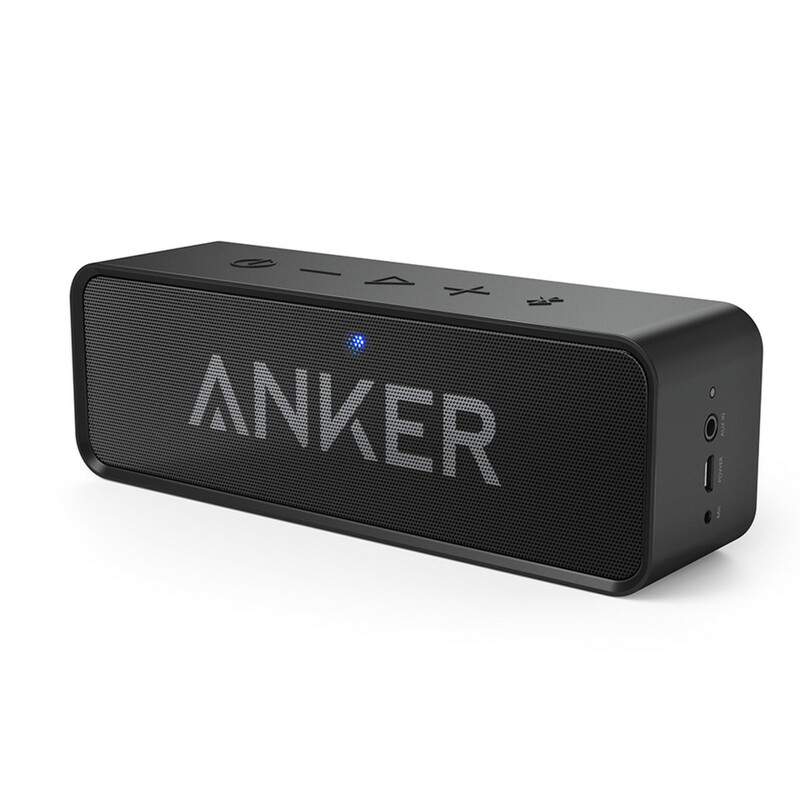 The problem is the three components share the same power supply and some associated electronics, necessitating some compromises in manufacture and, therefore, in the way it will likely sound. 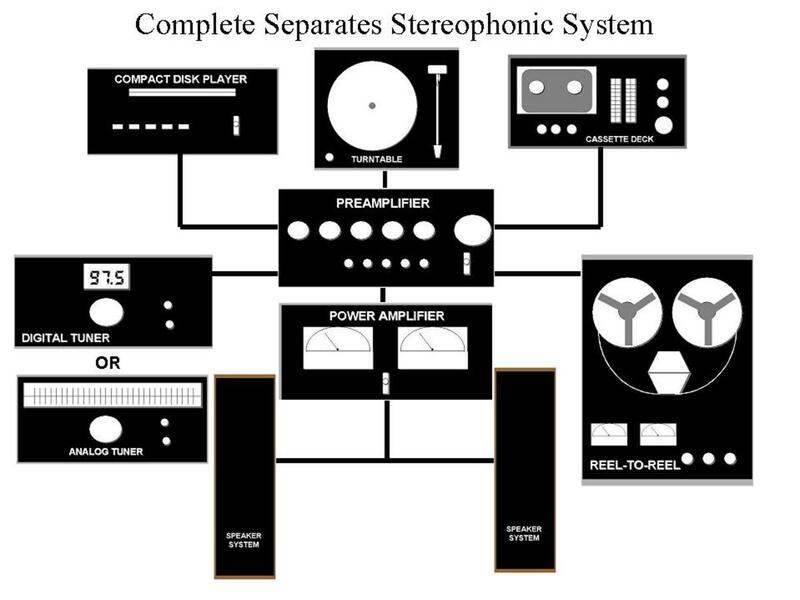 A "high-end" stereo system will almost always consist of separate preamp, power amp, and tuner. 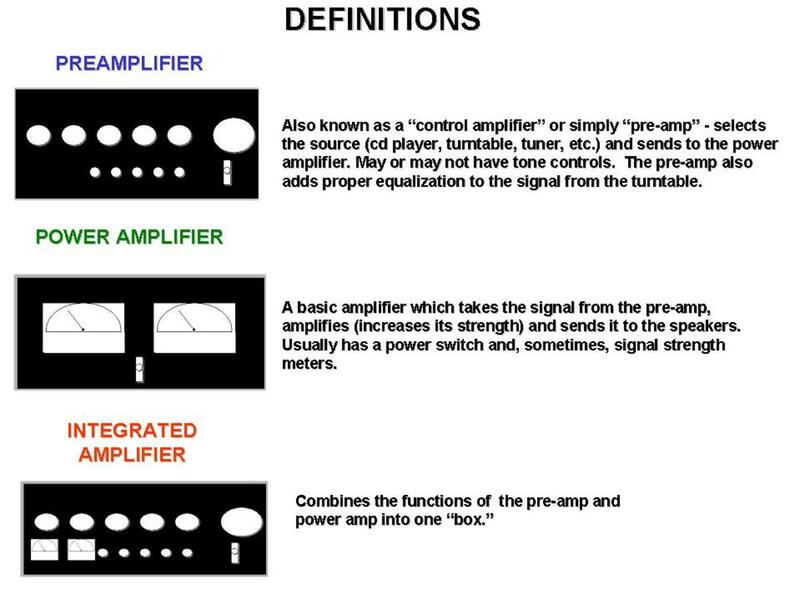 A bit of a compromise can be obtained by using an "integrated" amp, which has the functions of preamp and power amp, and a separate tuner if desired. "I thought the early CDs (and the players) sounded bright and the sound kind of . . . mechanical. The sampling rate for CDs had a fixed upper limit of 44khz, meaning a sharp drop-off after 22khz (with respect to frequency response). It was maintained at the time the humans could not hear frequencies above this limit so it didn’t matter. Wrong! It turns out that harmonics above 22khz do affect what we hear and the 'brick wall' presented by the 44khz upper limit was one of the factors responsible for the rather uninvolving sound of many CDs. Lo and behold, manufacturers started 'oversampling' in order to compensate for this effect. (A few years ago, one high-end manufacturer advertised a CD player with a slogan something like 'Finally, CD sound as good as vinyl!' I guess we’ve come full circle!)" Well, CDs and digital-to-analog converters (DACs) have "come a long way baby," and they do sound much better now. My system has both analog and digital sources but, although the CD format is quite convenient, easy to load, has no "clicks and pops" as many records do, and you don't have to flip them over, I still prefer the sound of vinyl! At this point one might ask, "what's the difference?" Undoubtedly the more elaborate the system the higher the cost. I could be "flip" here and simply say "you get what you pay for," but, I must say, that is usually true in the case of HiFi. When I was a salesman in an audio store a while back, I would tell my customers you need to spend about $2000 to get a good, entry level HiFi system. (This was in the 1990s but the figure isn't that far off today.) I would sometimes get an incredulous look and was told how they could buy a "rack" system complete with CD, turntable, cassette, amp, and speakers and a nice rack to put it all in at the local department store for arounf $1400 or so, or even less. I would try to explain to them they would eventually tire of listening to the "rack" system and, if they wanted to sell it and move up to a better system, they would get very little for it. Of course, if they were the type of listeners who are primarily interested in playing music in the background while they do something else, the "rack" system would do just fine. Stereo components - tuner, integrated amp, and one of the speakers. High-end enthusiasts sometimes refer to such equipment as "Oriental mid-fi!" For those who actually wanted to listen to music, the department store "rack" system would soon turn into an albatross. (Ironically, today one cannot even find stores selling these types of systems at all.) I had the habit of taking prospective buyers into our "high-end" room and let them sit down in front of a $50,000 system and listen to music for a while. After I heard exclamations of "My God, who can afford that?" and the like (you'd be surprised how many systems are sold at that price level or higher), I would say something like "Forget the price for a moment and tell me what you experienced." In most cases, they would say something like "the best sound I ever heard." Then the next step was to try to get them into a system which was as close to the high-end system they could get within their budget. 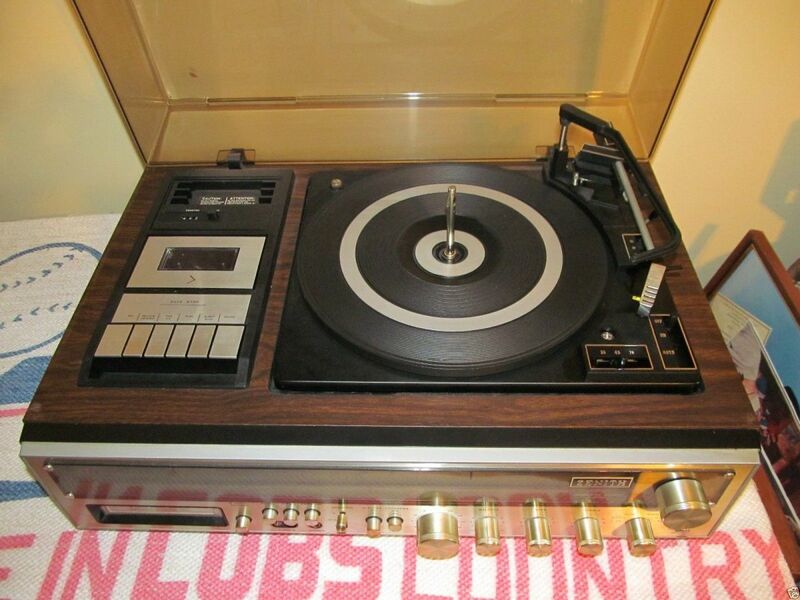 Naturally it isn't easy to get close to that level of fidelity with a couple of thousand bucks but I usually sold them a system which cost just a bit more than the "rack" system would have, and sounded much better (and lasted longer as well). Ah yes, the sound. That's what "HiFi" is all about. 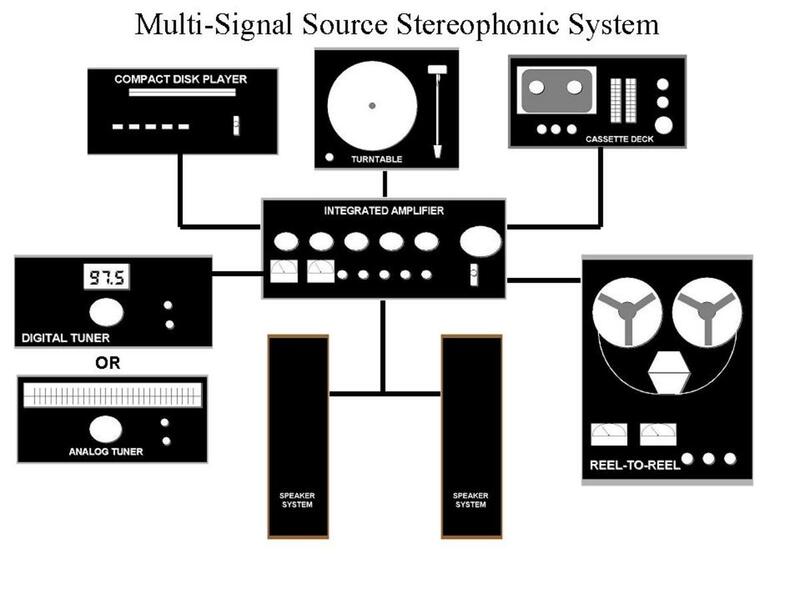 A good audio system today should meet two criteria: it is stereophonic which means it gives the listener the proper spatial information (i.e., creating the illusion of directionality and audible perspective), and it is high-fidelity, (faithful to the original). 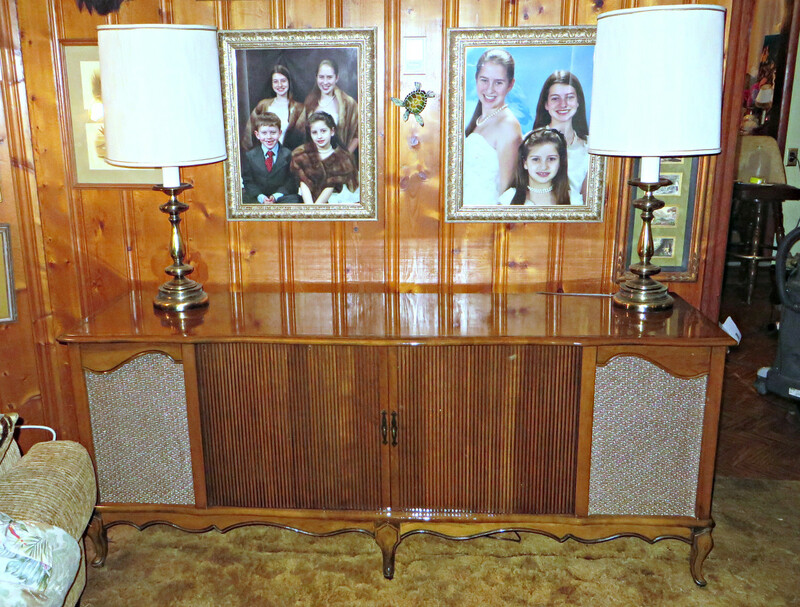 There are many "stereos" that are anything but "HiFi." I can sit in front of my system and "see" where the different instruments are placed, where the soloist is, etc. A realistic recreation of a given performance in time and space is what high-fidelity is all about. Do better components sound better? Yes they do. (I could get into the age-old argument of subjective versus objective testing here, but I'll restrain myself. Suffice it to say specifications do not always tell you how a given component sounds. 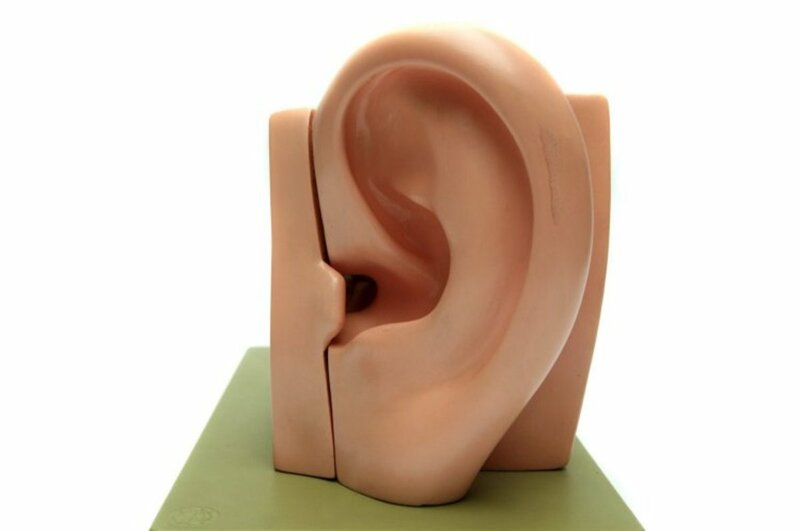 Trust your ears, they are the most important tools you have when you are looking for audio equipment.) Okay, but what about the "high-end?" Is it necessary to spend that kind of money (usually tens of thousands) to get satisfactory sound? No, of course not. In fact, sometimes one comes across the law of diminishing returns; i.e., it would cost much more money to extract that last percentile of fidelity. 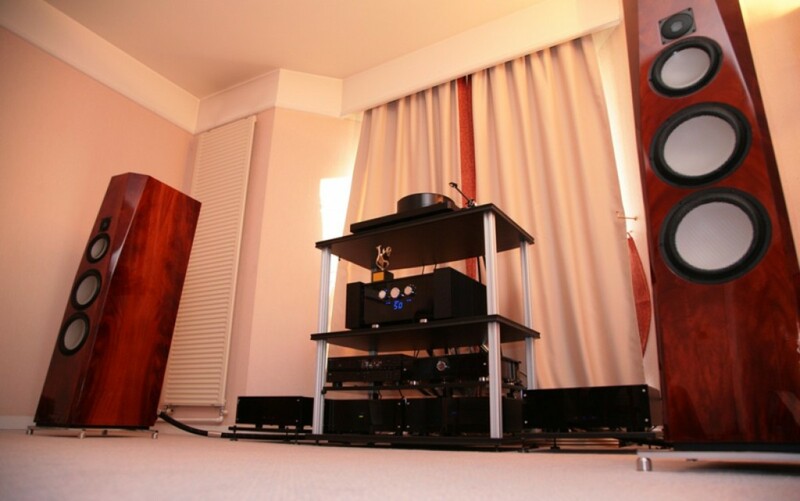 But there are well-heeled audiophiles out there who do spend "big bucks" for high-end systems. A few more thoughts about elaborate systems. 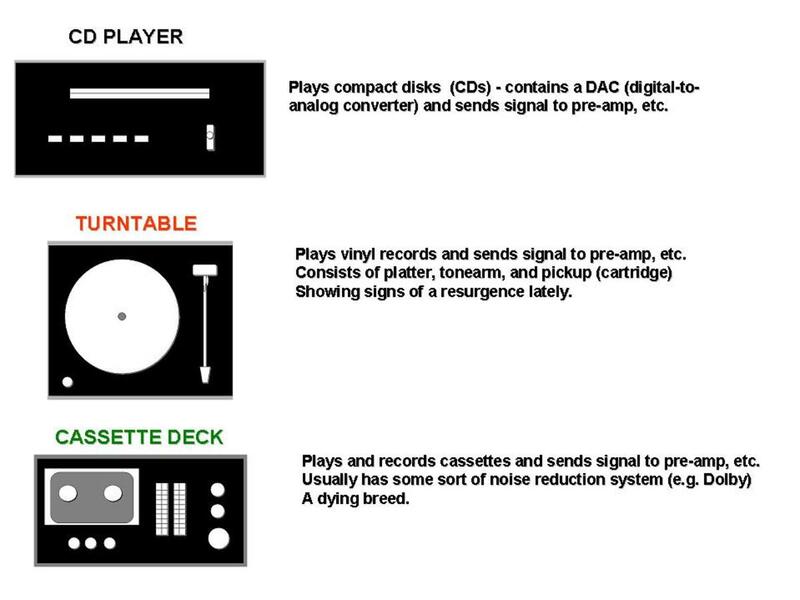 First of all, they can be as elaborate as all get out, with separate power supplies for amplification components, separate digital-to-analog converters for CD players, etc. And do not forget interconnects (the wires leading from one component to another) and speaker cables. There are interconnects and speaker cables out there costing literally thousands of dollars. (Do they make an audible difference? Yes, if the rest of the system is of that calibre.) 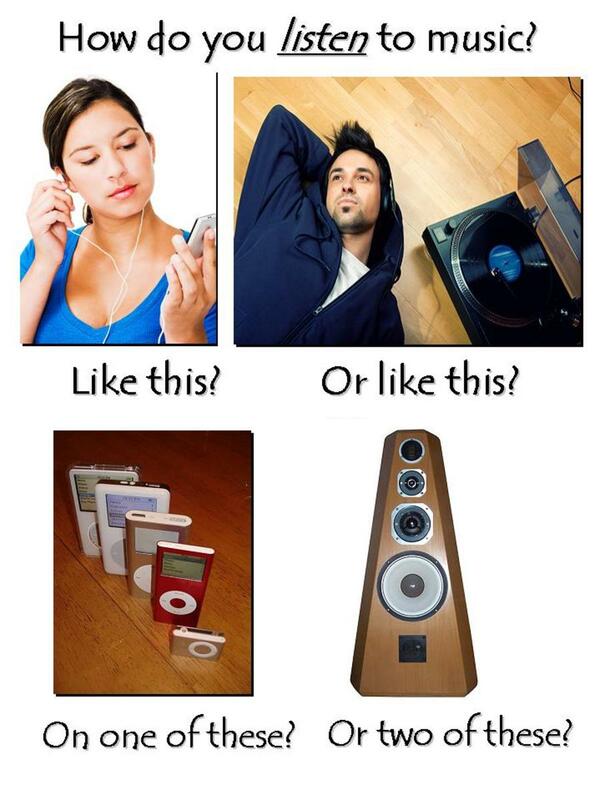 Further, it is advisable to keep stereo and home-theatre systems separate - they perform different functions. 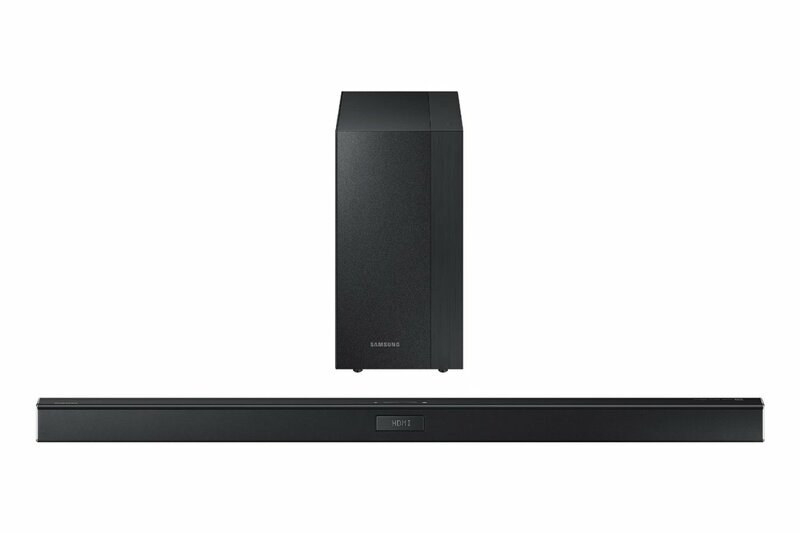 (Yes, you can get decent sound from a home-theatre system when you play music, but speaker placement, for one thing, is very different in multi-channel systems and the stereo effect can be lost or muddied. 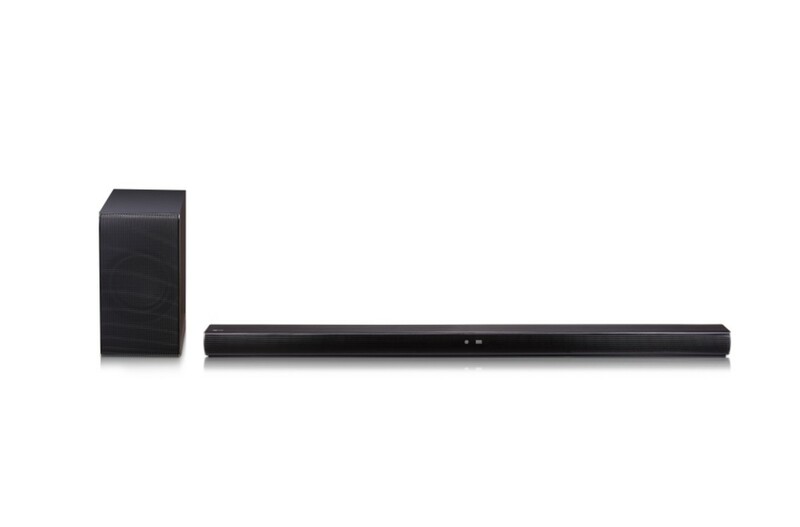 If you can afford it, buy separate components for your HiFi system and use an AV receiver for home theatre.) Yes, doing it this way costs more money, but isn't that the case for all good things in life? A truly "high-end" audio system. So What's it All About? Music! So, what's it all about? It's about music. Again, I believe most people do not listen to music, they only hear it. As I look around at people walking through the city, see them on TV, and so forth, I see them with tiny earplugs, attached to a portable, digital music player and going about their business. That's fine, but I suspect their listening habits at home are similar; music as "wallpaper." Not me. I sit down in front of my system, and I listen to music. If you really like good music (yes, I know, what constitutes "good music" is a matter of opinion), then sit down in front of a good HiFi system in comfortable chair and listen. Believe me, you'll never be satisfied with the little "iGizmo" again! In any case, as always, I wish you good listening! I seem to have a "troll" commenting on some of my hubs. Anybody else experiencing this?